Find the right tour for you through Charang. We've got 19 tours going to Charang, starting from just 13 days in length, and the longest tour is 37 days. The most popular month to go is May, which has the most number of tour departures. "“The Peregrine Treks' guides and porters made the trip possible and amazing. They..."
"Our guide was really funny and showed us all the nice places. 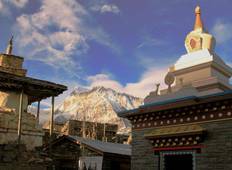 We always stayed in..."
"I traveled to Lo Manthang with Scenic Nepal Treks. Dipendra organised everything..."
"wow.....that trip was to mustang was so good. from hotel service to the transportation..."